Over the last few years, 38 Degrees members have joined forces with local communities, anti-fracking groups, and other campaigners to fight against fracking in the UK. Together we’ve won some things … and we’ve lost some things! Today we won in Lancashire. When dirty energy company Cuadrilla applied to tear up Lancashire’s countryside for fracking, we jumped into action. 38 Degrees members in Lancashire have sent over 11000 emails to councillors and over 1100 letters to local papers. 9000 signed a petition. Together we got 25,000 anti-fracking posters up in windows across Lancashire. And the week before the final vote, hundreds of 38 Degrees members chipped in for an emotional video warning of the dangers of fracking – and made sure millions of people watched it. Meanwhile, 38 Degrees members across the UK stood with Lancashire – 90,000 of us signed a petition standing in solidarity with the county. And thousands of us chipped in to fund the fight. We’ve given grants to grassroots groups to help local fights. In 2013, we came together and chipped in to help grassroot groups fights against fracking on their doorsteps. In total we gave £50,000 to 25 community groups. And if you want to see just how many local fracking fights 38 Degrees members have been a part of, go here. We were a key part of the fight in Scotland. After a huge petition, thousands of emails and legal fights – 38 Degrees members in Scotland convinced the Scottish government to introduce a moratorium on fracking. And in Falkirk, 38 Degrees members chipped in £20,000 to the legal fund of a local group fighting a commercial ‘coalbed methane field’. And together we stood up against changes to trespass laws. Which would allow dirty energy companies to drill under our homes without permission. Together we called, emailed and tweeted our MPs in our thousands, making sure they knew that ordinary people didn’t want dirty energy companies drilling under our homes . Unfortunately, it wasn’t enough to stop the government voting to change trespass laws. But without pressure from 38 Degrees members, Greenpeace, Friends of the Earth and thousands of grassroots groups, it could’ve been much worse – we won some important concessions. 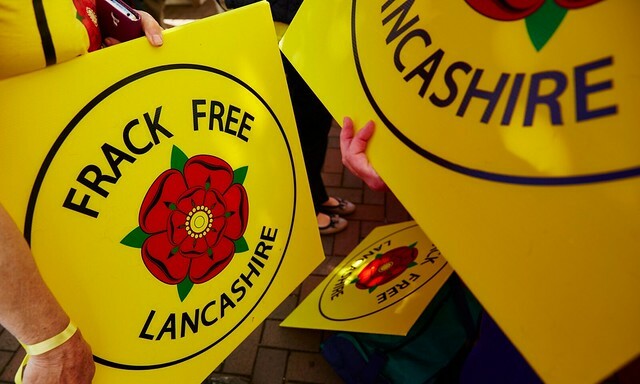 Today’s decision to reject fracking in Lancashire is a huge win for people power and a real blow for the fracking industry. But, the fight against fracking in the UK isn’t over. David Cameron and his government are keen to plough ahead with shale gas. As for Cuadrilla, they may well lodge an appeal. If they do, the government could step in and overrule Lancashire Council’s decision against fracking in their beautiful countryside. But today’s result has shown us that when local people come together and get organised – amazing things can happen. International energy corporations with millions of pounds can be beaten. Councillors can be persuaded to vote for people and our environment, not dirty energy. Together, we can make sure our messages can reach millions of people through videos, posters, rallies and petitions. “Thank you so much for your unfailing support for us, against Cuadrilla. We are breathing huge sighs of relief here, not just for ourselves in Lancs; but the rest of England & we hope the world. Let’s let Lancashire’s fight be an inspiration for how we can win the fight ahead. Together, in our communities – locally and nationally – we’ll be ready. If you’ve got any comments or ideas about the fight ahead, please write a comment below.